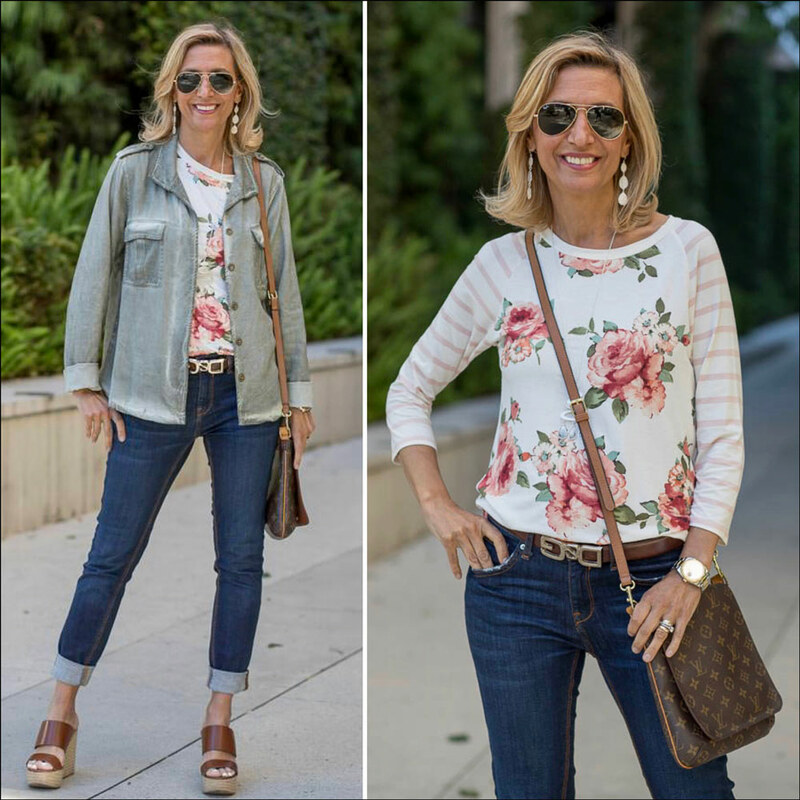 Since green seems to be one of the hottest colors for this spring, I wanted to restyle our Sage Stone Washed Jacket with Lace Back Yoke today, which I first debuted for you here. This jacket is a casual fun piece with a great trendy color and beautiful detailing with its stone wash finish and lace detail in the back. The jacket has a utilitarian vibe, but the lace in the back gives it a unique and feminine finish. This is why you can easily wear it casually with jeans or dress it up a little bit over dresses or skirts. For today’s look I paired it with my denim skinny jeans and a new floral stripe t-shirt, our Ivory Pink Green Floral Stripe T Shirt. 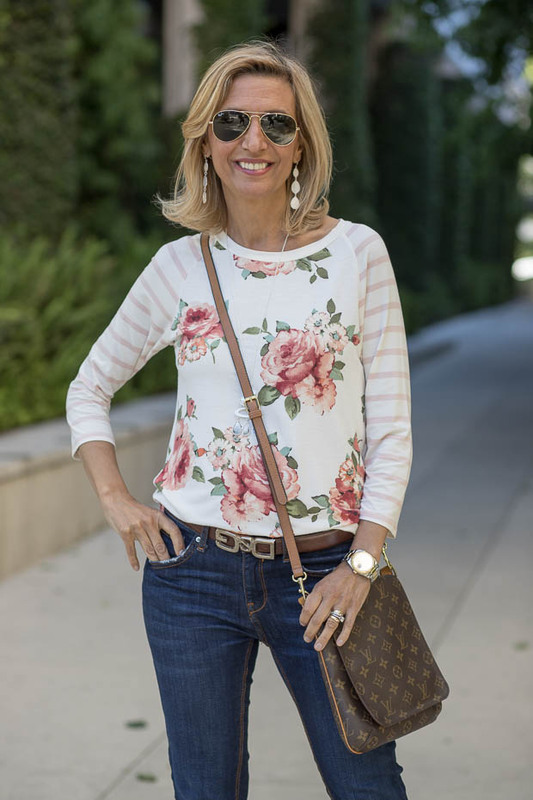 This is one of our new color combos in these floral stripe t-shirts, which we keep coming up with since they are always super popular. This one has a really pretty color combo of ivory, pink and green and that is why it works really well with the sage jacket. The body is an ivory base with shades of pretty pink flowers with green leaves and the sleeves are a stripe combination of pink and ivory. 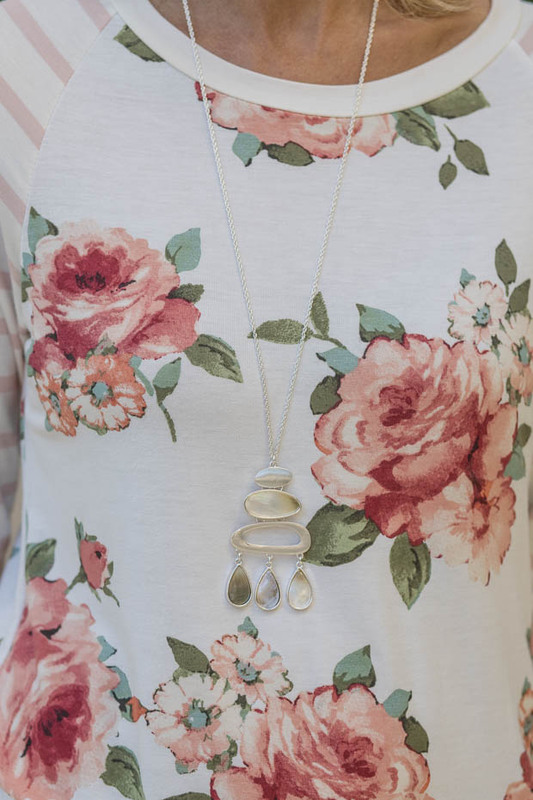 As for accessories, I chose to go with silver today adding our Matte Silver Shell Drop Earrings and Matte Silver Chain necklace with a Matte Silver Shell Pendant. These earrings and necklace are almost a set as they both have the same matte silver and shell components so they look really good together. All four pieces I am showing you today are part of our Weekend Flash Sale where you can get 15% off with code FS413 plus Free US Priority Shipping. All international shipments are a flat rate of $25.00 for as many items as you like! Sage is such a beautiful color! I don t see it often in the stores though. Happy Sunday! I love sage too and you are right there is not a lot of any kind of greens in stores. Thank you for stopping by. Thank you, it is exciting to get those spring and summer clothing out finally. I love that jacket! I kind of have a hard time passing up a jacket especially if I am thrifting but your sage jacket reminds me of a jacket I have not worn this year yet that has really pretty crocheted details in the back! I think I will wear it tomorrow! Wow that’s great, I would love to see how the jacket looks on you! Thank you for stopping by.